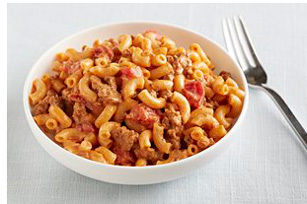 Why make plain old mac and cheese when you can just as easily make this cheesy 20-minute Deluxe Chili Mac? Prepare Kraft Deluxe as directed on package. Meanwhile, brown meat in large nonstick skillet. Stir in tomatoes and chili powder; cook 5 min. or until heated through, stirring occasionally. Add Kraft Deluxe to meat mixture; mix well. Sprinkle with crushed tortilla or corn chips just before serving.